The VOSI isn't really a fly, it's a "fly enhancer". Think of it as the flyrodder's popping cork. In some instances, it may be used as a strike indicator for freshwater submergent flies. The inspiration for the VOSI came from Pete Cooper's Perch Float Popper. The popper is made by cutting a styrofoam perch float in half, making a slit in the half-body, and gluing to a threaded hook. Directions can be found elsewhere on the Flies list. 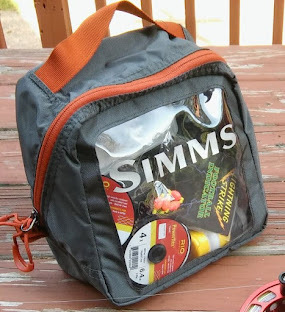 Circa 1992, a few saltwater fly anglers were using the popper along with a Clouser Minnow or Charlie as a "popper-dropper" rig, where the submergent fly was suspended under the popper by a section of tippet tied to the popper hook. Two problems with this rig: the depth of the dropper couldn't be adjusted without cutting and retying, and the dropper section kept getting tangled in the popper hook. Instead of using a popper, I simply took the half-a-perch-float-body, drilled out a concave face, and made it into the fly rodder's popping cork. Since "perch float" lacked respect among some fly anglers, I gave this creation the name "Vertically Oriented Strike Indicator" (VOSI). Besides, unlike a perch float, the VOSI requires the correct leader formulation to insure the proper displacement of the trailing fly and it's action in the water. It's all in the 14 page operations manual. 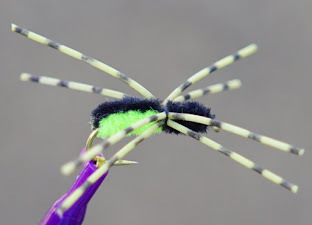 Seriously, the name refers to the fact that it hinges the leader and fly into a vertical orientation, ie, about 45-90 degrees to a floating fly line. The VOSI sits horizontally in the water, but when a fish strikes, even just a nibble, it bobs into a vertical orientation. If the cork goes under, it's time to set the hook. 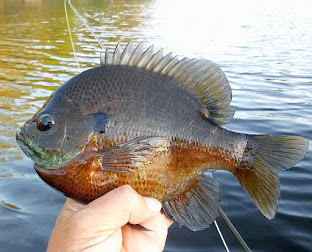 For freshwater, the pointed end faces the fly line. A slight twitch is all that's used. In saltwater, when fishing for specks, the concave (wide) end faces the fly line. The plastic pin is inserted into the narrow end to reduce the chance of it falling out. A good twitch of the rod tip causes the VOSI to pop, enticing specks and reds to investigate the fly beneath. Perch floats in either 1 1/2" length or 2" (slightly wide) length. The larger corks are almost always used for saltwater, for choppy conditions, but require a higher weight rod to cast. The smaller floats can be cast with as little as a 3 weight, but a 5 weight is recommended. A dremel bit tool, conehead sander. Sanding paper, 400 grain is good. 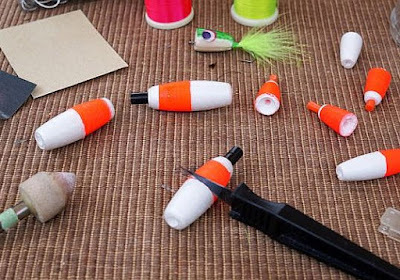 Using a Xacto knife, cut the perch float in half. Most of these floats come with a white end and a red end. If you plan to make Kirk's Perch Float Poppers, save the white end for that purpose (it eliminates having to do a primer coat). Take the Dremel bit and bore out a cup face in the half-floats. Do this by hand - using the Dremel tool is not safe, and will eat away too much of the styrofoam. If you wish to create a slit, take the Xacto knife and carefully cut lengthwise to the center. Take the sandpaper and pass the edge into the slit, then sand out the slit so it's wide enough to accept your leader. If water is choppy, then a larger size vosi will work. If you have trouble making the vosi pop in saltwater, then modify the plastic pins. At the wide end of each pin, add a few wraps of lead weight and cover with thread, then epoxy over. This sinks the vosi just enough to make the cupped face "grab" water when stripped.